Actor Terry Crews has been outspoken about his sexual assault, which happened at an industry event back in 2016 when Adam Venit, an agent at WME, allegedly groped the actor’s crotch. Crews knows that one of the best ways to help turn the tide of victim blaming and free passes is to speak up, and he’s been a valiant and tireless member of the #MeToo movement almost since its inception. Sadly, what we’ve all learned from his bravery is that even men – and famous men, at that – are not exempt from having to defend their claims of sexual assault or defend their actions at the time the assault occurred. It’s been going on for some time, and one of the first instances came in the form of an email from Russell Simmons and suggested Crews accept Venit’s apology and give the guy a pass. Crews posted the exchange, and everyone with a brain and a heart gave him a virtual fist bump. Then it was Tariq Nasheed, who got into a Twitter argument with Terry Crews that devolved into this comment. I don’t know why actor Terry Crews is so mad at me. Now, we’ve got actor and comedian D.L. Hughley showing his a** and losing fans over his ridicule of a sexual assault victim and pretty much the entire #MeToo movement while he’s at it. Nice. It is never, ever, the victim’s fault, regardless of how they did or did not resist an assault. Jerk. Luckily for Hughley, Crews isn’t the type to waste those muscles on a duma** like him, so he used his mind muscle to fire back on Twitter. 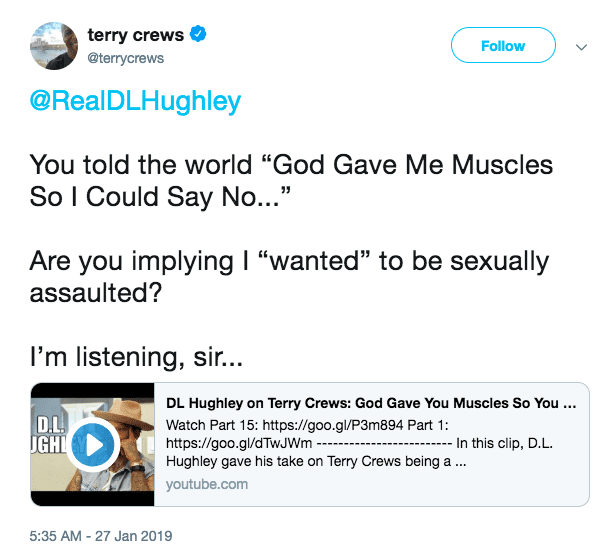 Hughley declined the opportunity to apologize and slink away, upping the ante with a comment stating that the actions Crews took in his own defense weren’t strong enough. Seriously? Who does this guy think he is? Add to those comments the fact that Hughley commented on #MeToo saying “Everybody is so into this notion that ‘it happened to me too,'” seeming to indicate he thinks it’s like some cool bandwagon people are jumping on, and the man lost this fan for life. 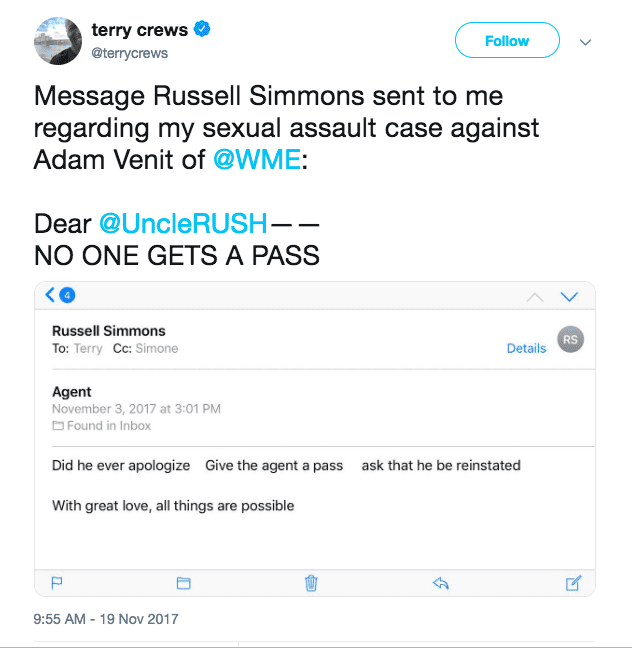 For the record, Crews ended up dropping his lawsuit against Venit after prosecutors declined to charge him – the sad, unfair ending of far too many sexual assault cases. Props to Terry Crews for being someone assault victims of all genders can feel good looking up to.